Steel case with handle and wall hanging brackets. 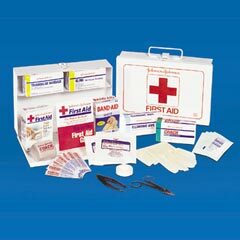 87 first aid products: elastic bandages, gauze roll, BAND-AID®s, non-stick pads, triangular bandage, tape, eye pads, antiseptic wipes, instant cold pack, scissors, tweezers, gloves and first aid guide. 10-1/2w x 7-5/8d x 2-1/8h. Shpg. wt. 4 lbs.